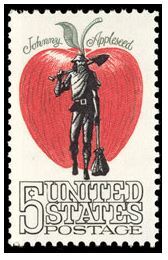 September 26 is National Johnny Appleseed Day. For those of you who may not be familiar with this oft-overlooked holiday, here’s the lowdown on who Johnny is and how to celebrate the day! I know when I worked with 3rd graders, Johnny Appleseed was celebrated and taught with enthusiasm. He is an affable American hero that we can all be thankful for. Even if you don’t like apples or apple pies or apple fritters or applesauce or apple muffins or dried apples or bobbing for apples or making apple witches (seriously – does anyone not like something here? )… you can enjoy the story and legend behind his germination of apple orchards throughout the Midwest Ohio River region. John Chapman, aka Johnny Appleseed, was born September 26, 1774 – hence the timing of Johnny Appleseed Day. Rumor has it Johnny’s orchard smock was made from a coffee sack with holes cut out for arms and he wore his cooking pot on his head while traveling. Can’t verify that is true, but it does make for some great graphics for posters and children’s books. JA was able to acquire large tracts of land from western Pennsylvania along the Ohio River on which he transported 16 bushels of apple seeds and saw to their plantings. At that time, certain requirements were set before the colonies granted land rights. There was an act defining how the land was to be used. Why should we care about the lowly apple? Henry David Thoreau, a naturalist and noted author, took time to pen the following related to the timing of men’s and apple’s appearance on the earth. 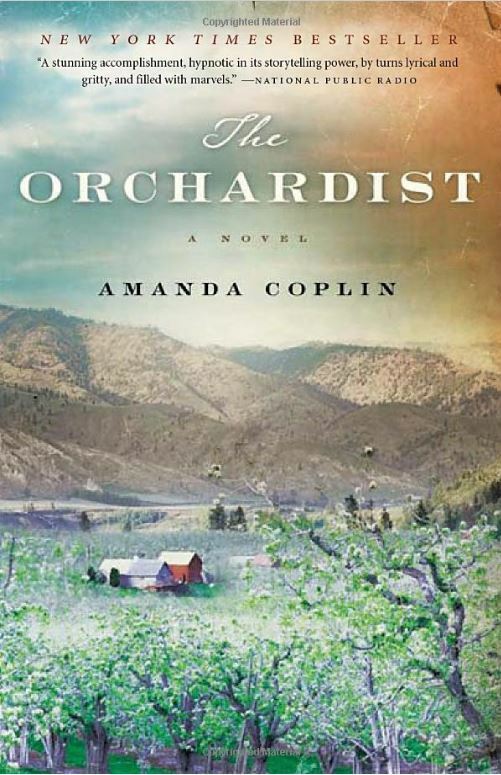 The Orchardist by Amanda Coplin: A great book about the life of an orchardist. It’s fiction that rings true. The story revolves around William Taldrage’s care of his apple and apricot orchard and the peace and solace it provides him. It also provides insight into the thinking and hard work of a dedicated and professional nurseryman. For some time I have nurtured the fantasy of being an orchardist, but details like hard work and commitment didn’t enter in to muddy my fantasy! Apple Butter. Who could resist the opportunity to have this great smelling concoction simmering away while enjoying a lovely fall day full of your favorite pursuits?? Click on the picture for a great recipe courtesy of Cooking Light. Baked Apples. 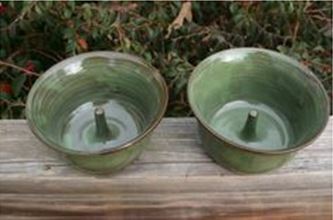 My husband and I found these pottery dishes for baking individual apples. (This must have been in one of the in-between times when we didn’t have any chicks that had yet to return to the nest and individual dishes seemed like a great idea.) We just wash the apple, core it, place it in the dish and cover with cinnamon, brown sugar, whatever other spices look great and bake at 350° for about 20 minutes. This is one of our favorite desserts! Apple Products. Mac Book, ipad, iphone – all great devices which can add new dimension to your busy lifestyle and streamline certain processes. They also teach great lessons in why we don’t always need to be connected to our great devices. We can use the apple logo to remind us to get out and enjoy the natural things in life from time to time. I’ll bet there’s an app for that!!! Apple Cider/Wine. I feel wine of any sort really needs no explanation. If you feel like making your own apple wine, click on the picture for instructions. If you would rather just pick up a bottle, I am sure this seasonal wine is available at a great artisanal wine shop somewhere near you! Take some time to celebrate the versatile apple and give thanks for all it’s history and delightful pleasures!! Scientists believe that apples were first domesticated in the Tian Shan region of southern Kazakhstan. In fact, by as early as 2000 BC, domesticated apples were being grafted in the Near East. The Greeks and Romans introduced the domesticated apple to North Africa and Europe during their trading and conquests.